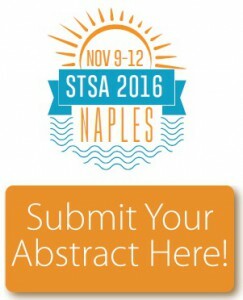 The deadline to participate in the STSA 2016 call for abstracts is Monday, April 4, 2016, 11:59 pm, ET. The deadline to submit STSA 63rd Annual Meeting abstracts is Monday, April 4, 2016, 11:59 pm, ET. Visit www.stsa.org/abstracts for additional information about the abstract submission process and the many benefits of presenting your work at the STSA Annual Meeting. Review the 2016 STSA 63rd Annual Meeting Abstract and Surgical Video Submission Guidelines. Access the STSA 63rd Annual Meeting abstract submission website. New in 2016, each STSA abstract co-author is required to submit their personal financial disclosures. This process has been put in place to alleviate the burden on primary authors (who were previously responsible for collecting and submitting all co-author disclosures) and to ensure that the financial disclosure collected is as accurate and complete as possible. 1. Log in to the STSA abstract submission site using your personal username and password, and select General Information from the dropdown next to your name on the top right-hand menu. 2. On the General Information page, go to the Disclosure step, and complete all sections with a red asterisk next to them. Not sure of your STSA abstract submission site username or password? Click here to access the Forgot Password page. Call or e-mail us for additional assistance. For technical questions regarding submissions, e-mail Technical Support at ts.acsupport@thomson.com or call 434.964.4100. Technical Support is available Monday-Friday from 8:30 a.m. to 8:30 p.m., ET. For non-technical questions regarding submissions, e-mail STSA at stsa@stsa.org or call 312.202.5892.